20 cm tall (8 inches). 24 cm long (9.5 inches). 13 cm depth. 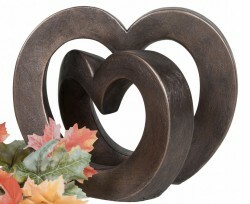 Solid cold cast bronze resin contemporary sculpture of two hearts entwined together. Great Engagement, Wedding or Anniversary gift or just simply to give your loved one. Sculpted by Adrian Tinsley, his initials are engraved in the sculpture.